When heading out to ski the backcountry for the first time it’s not uncommon to be bamboozled by terminology. The mountains might speak their own language, but increasing your backcountry vocabulary will help you better understand avalanche bulletins, trip reports and the skier-to-skier conversations that discuss the best (or safest) route that day. And so, here are 21 need to know terms for skiing in the backcountry. Note: Before embarking on a backcountry ski trip make sure you have the tools, skills and training for avalanche self-rescue. Mountain terrain above the tree line that includes but is not limited to peaks, bowls, glaciers and couloirs. The act of waking up early during the predawn hours in order to reach high elevation terrain relatively early in the day. An important consideration during spring months when snowpacks are susceptible to rapid warming. A device inside a backpack that inflates an airbag to avoid full avalanche burials. Most airbags are powered by battery or by a high-pressure gas cylinder. A section of wide-open terrain on a mountain’s face. Usually situated below a couloir (see below) or steep chute. Quite fun to ski. A daily report from a regional organization reporting current conditions and trends in the snowpack. 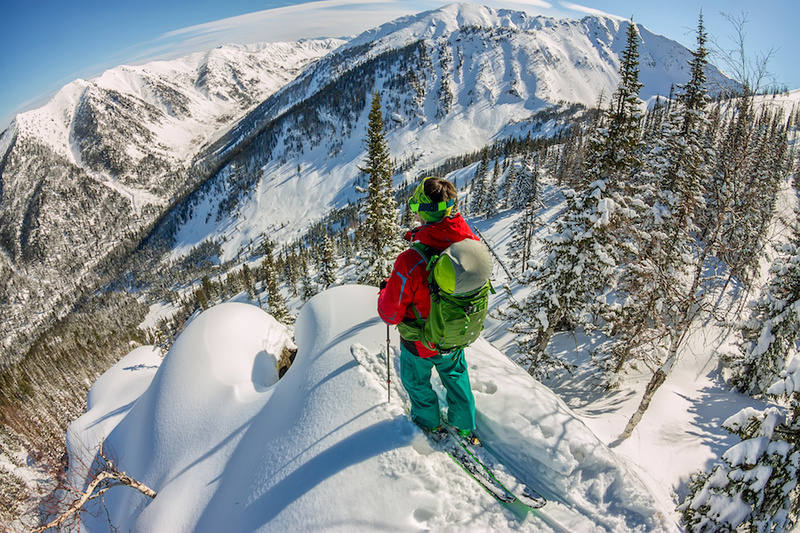 The first bit of information used when planning a backcountry ski trip. The surface across which a slab avalanche releases. This can be the ground but is usually a crust or a harder layer of snow. Not to be confused with a weak layer. A fracture or gap formation in glacial ice. Will usually form perpendicular to the tension in the ice as a result of glacial creep. Crevasses are mostly found at convexities in the glacier and are often hidden during the winter months under snow. A steady accumulation of snow will eventually form a stable snow bridge across the crevasse, but rope rescue equipment and training is necessary in all glacier travel. When wind blows across a cross-loaded slope, snow is picked up from the windward side of ribs and outcrops and is deposited in lee pockets (see below), which can release if triggered by a skier or snowboarder. Large, hollow snow crystals with edges, rims and ripples on the surface, the result of faceting (see below) amidst high internal temperature disparities in the snowpack. Depth hoar is an accumulation of cup-shaped crystals and often generates weak layers in the snowpack. Has several meanings but usually refers to being in a highly hazard environment. This can be exposure to vertical terrain and the threat of a fall, or exposure to the sun and/or the cold. When snowflakes morph into angular grains that bond relatively poorly to one another and can create a weak layer. Rate of faceting depends on the temperature gradient (i.e. the difference in temperature throughout the snowpack). An area on the downwind side of ridges and other terrain obstacles where wind flow often deposits deep accumulations of snow. Usually refers to those slopes sheltered or protected from the wind. For example, an east-facing slope is in the lee of a west wind. Another French word used to describe the gear or technique used to describe alpine touring. The literal translation is “excursion” or “tour,” so tends to precede the word “ski” (in French) to distinguish from other types of tours such as trekking or cycling. Progressive stabilization of steep snow slopes by small, usually harmless avalanches. Technically, a sluff is any snow slide that moves less than 150 ft (50 m) slope distance. Snow crystals, often shaped like feathers, spikes or wedges, that grow upward from the snow surface when air just above the snow surface is cooled to the dew point. Think of it as the winter equivalent of dew. Surface hoar grows most often when the wind is calm or light on cold, relatively clear nights. These crystals can also grow during the day on shady slopes. Once buried, layers of surface hoar are slow to gain strength, sometimes persisting for a month or more as potential failure planes in the snowpack. Blizzard or thick cloud conditions where the horizon is indistinguishable from the white sky. White-outs can make it impossible to determine which direction one is travelling or even if one is moving or stationary.